3-7 working days after receipt of payment only from orders in Europe. 2-3 weeks after receipt of payment from international orders, but it usually takes less time. It’s depending on the availability of the item after payment is received. This period takes into account the time of preparation of the package, mailing and any variable lags thereof. For custom orders, delays in manufacturing and delivery will be agreed between buyer and seller. The tracking number of your package will be sent by mail once shipment. If you like we can ship gifts to alternative addresses. Just let us know during checkout. If you would like a gift card to be included in your package we will be happy to include a small one free of charge. To the benefit of our planet we try to reuse a lot of packaging materials. But don’t worry: We will always make sure that the items will be safe and sound in their boxes. Unfortunately, delays in the postal service (especially during holidays) are beyond our control. Shipping expenses vary from one article to another depending on the size and on the weight of the object. Max letter Deutsche Post and Hermes according to the weight and volume of items. If you order multiple items at once, I group the postage in a more appropriate package, for orders exceeding 80 euros. All packages are sent with insurance, unless informed otherwise during your order. 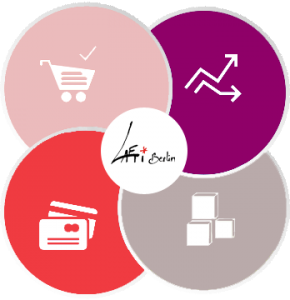 In special cases, if you need your order ASAP – please contact me prior to your purchase and I will send you a quote for express shipment.Laeti-Berlin is not responsible for loss, theft or damage to your goods by Post. It’ss a simple method to pick up your orders themselves. Requires a minimum order amount of 200 euros. Paypal: Banking information is secure, confidential and will in no case be transmitted to the vendor. Payment is required at time of transaction. All orders placed and not immediately paid for will be cancelled unless we hear from you.